It is with great sadness that I have to announce that New Day is closed. Thank you so much for all your kind words and support through the years. 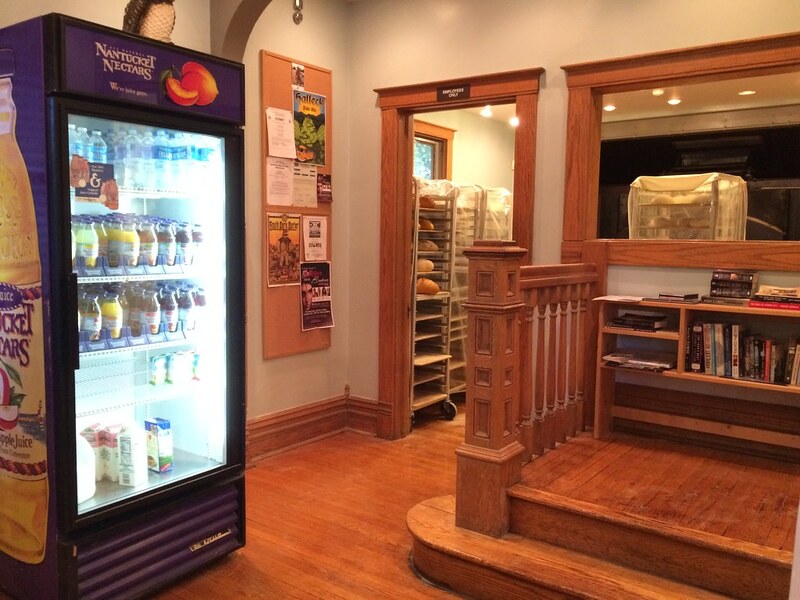 If you need to contact us, please send an email to newdaybakery@gmail.com. And don't despair - the heart of the bakery has always been that great brick oven, and she's not going anywhere - look for a new bakery in that space soon. The status received more than 100 responses, many lamenting the closure, others feeling encouraged by the nod toward a future bakery and all supportive. 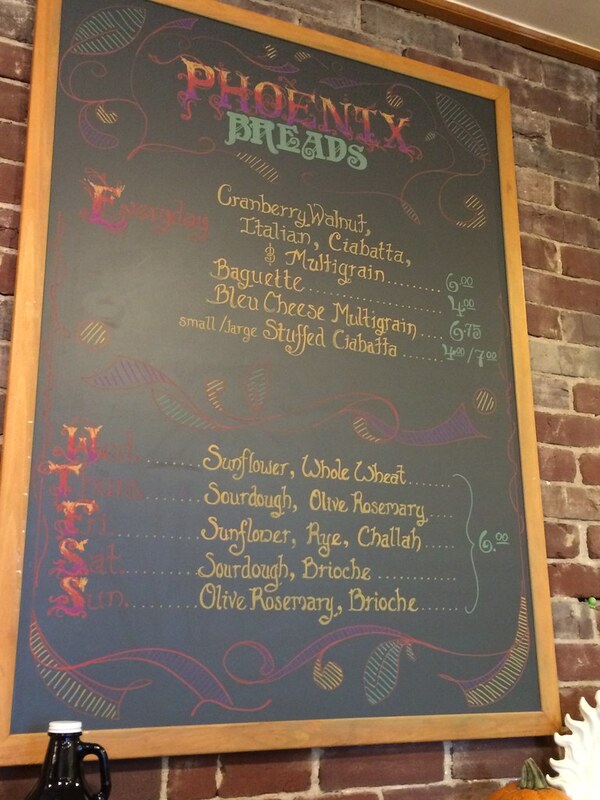 What has risen from the ashes of the former business is Phoenix Bakery. Employees banded together, started a GoFundMe site and raised money to help with its reopening. I'm still not sure why New Day closed; from what I could tell, it was well-received in the area. 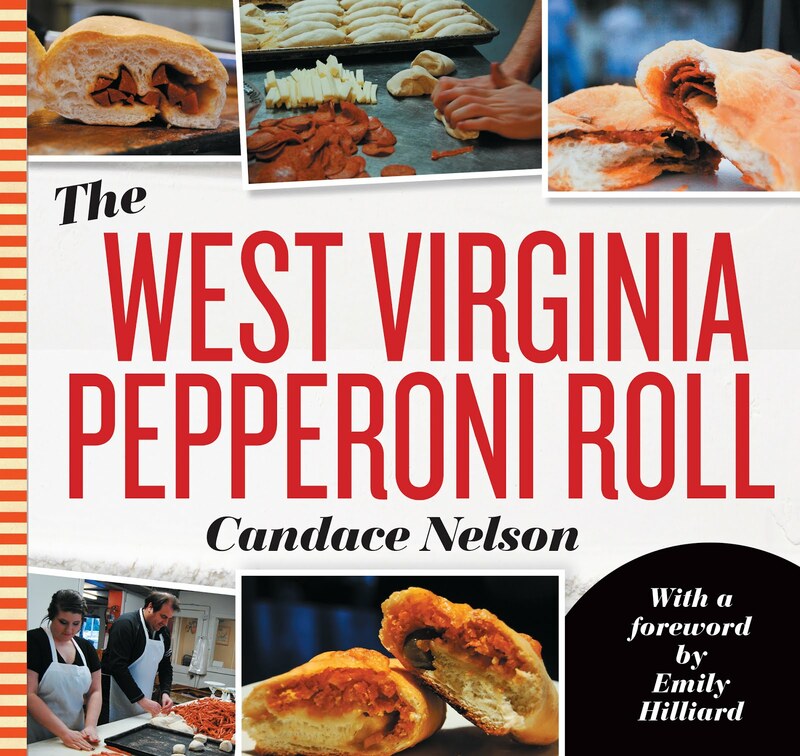 I frequently grabbed a stuffed ciabatta at the weekly farmers market, along with a coffee. 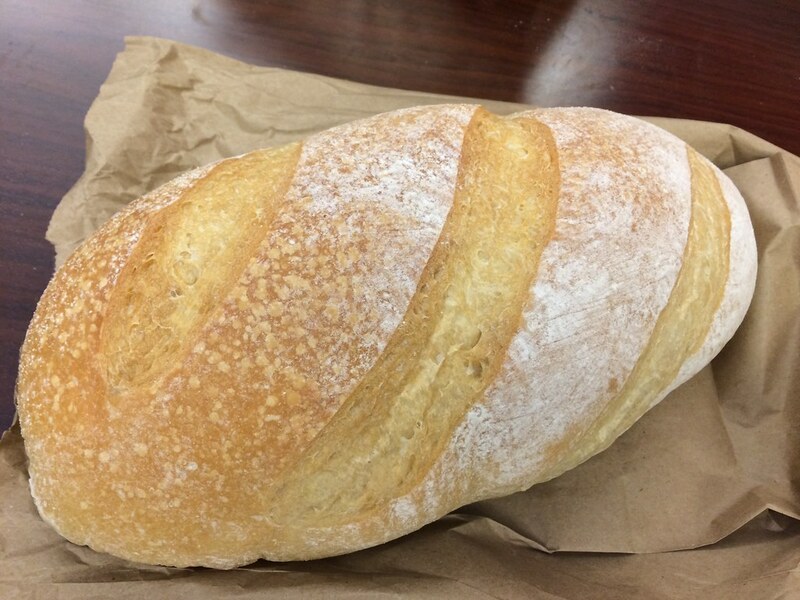 Sometimes, I would stop in the shop for a loaf of fresh baked bread (when I went out of my way, that is). 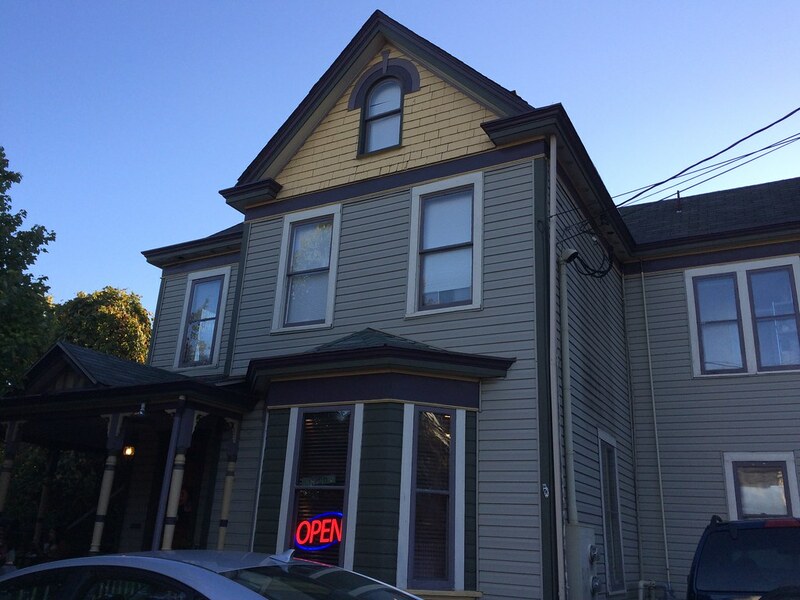 Regardless, I was happy to see that this Morgantown neighborhood bakery reopened in September. It is much the same with a front space dedicated to loaves of bread, scones and muffins, and on Thursdays, Fridays and Saturdays starting around 4 p.m., the shop turns into pizza heaven. 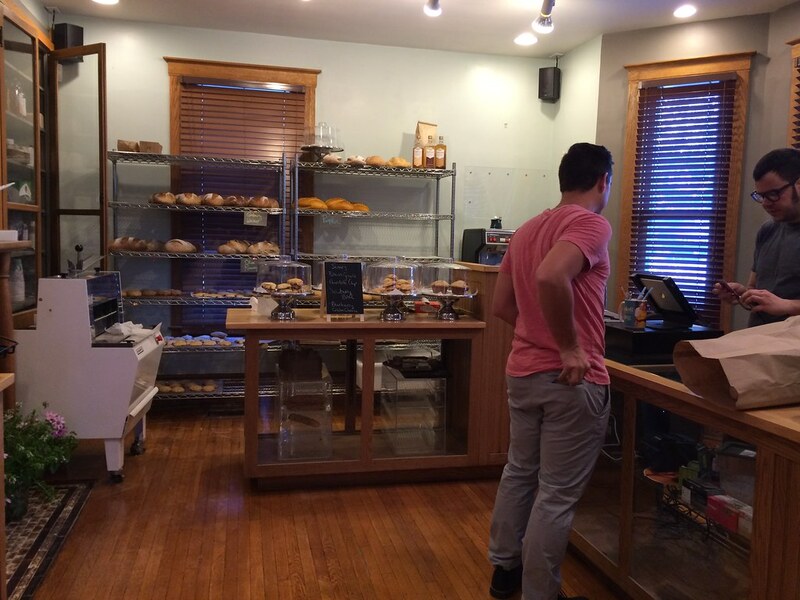 The bakery is currently open from 7 a.m. to 8 p.m. Wednesday, 7 a.m. to 9 p.m. Thursday through Saturday, and 7 a.m. to 3 p.m. on Sunday. Happy Sunday Oh Best Beloveds! 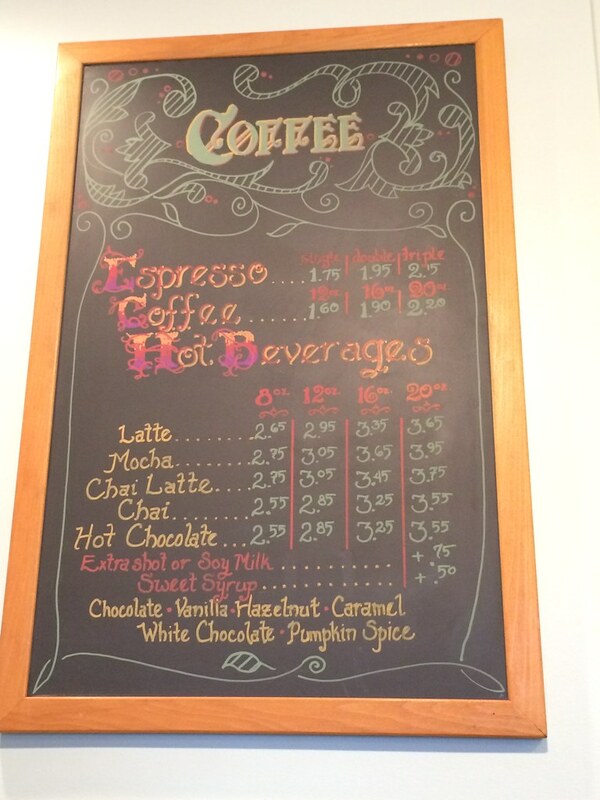 It may be cold outside but it is warm at the Bakery. This morning we have some scones : Dark Chocolate Cherry, Blueberry Cream Cheese, Rosemary Onion Parmesan, and Apple Pie (When I peeled the fourth apple, it came off all in one piece. So if you eat one, you might dream of your true love.). 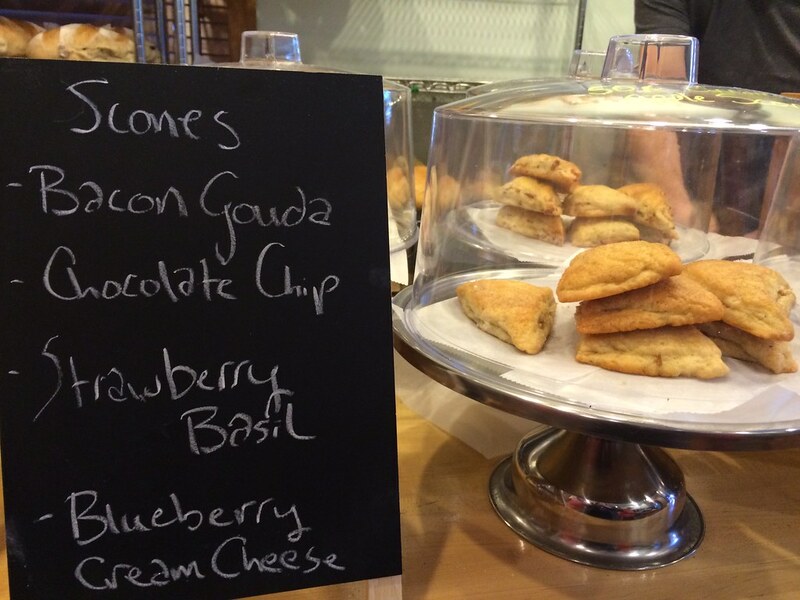 Muffins today are Lemon Poppyseed, and the biscottti case is full of your favorites. Hot cookies - Chocolate Chip and Molassess - will be coming out of the oven around 9. Breads waiting just for you include Cinnamon Currant, Cranberry Walnut, Olive Rosemary, 100% Whole Wheat, Italian, and many more. See you soon. I actually made two visits to this bakery. Once in the morning to get some delicious baked goods and once in an evening to get a pizza. (Also, PS how cool are those signs? Awesome). Let's get to it. 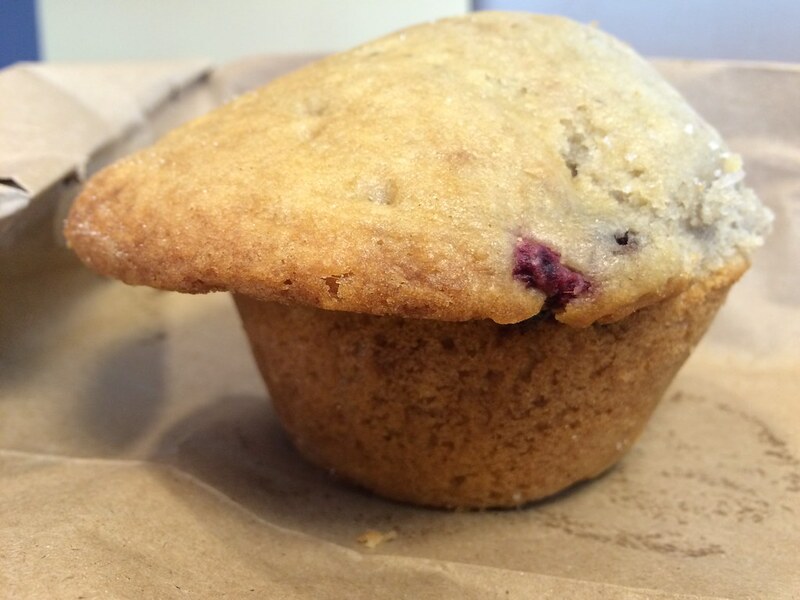 I ordered a blueberry raspberry muffin, which was my least favorite of the group. Why? Well, it's probably because it's vegan, and the consistency was just off for me. For vegans, though, I'm sure these are the best - because the flavor is still good here. 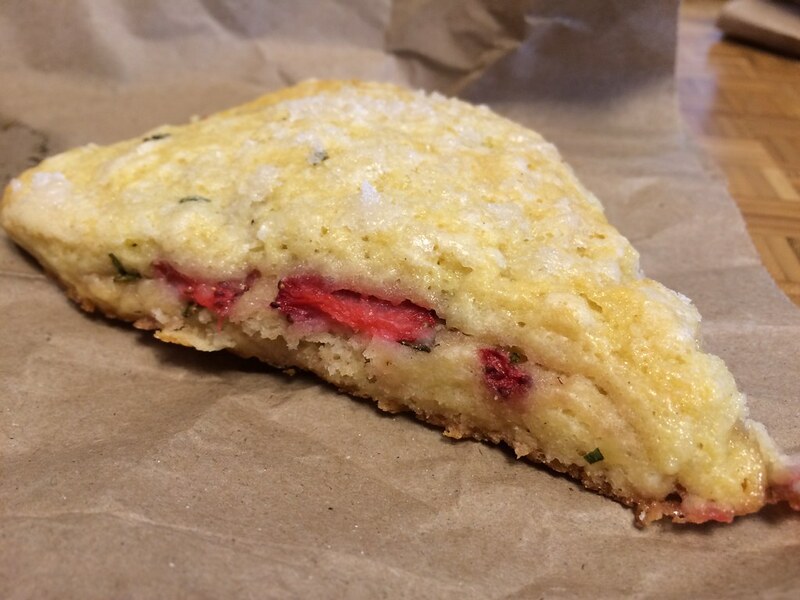 The strawberry basil scone, though, was very tasty. The strawberries were perfectly sweet. They don't skimp on the basil here. At one point, I got a solid bite of basil - but it was good! 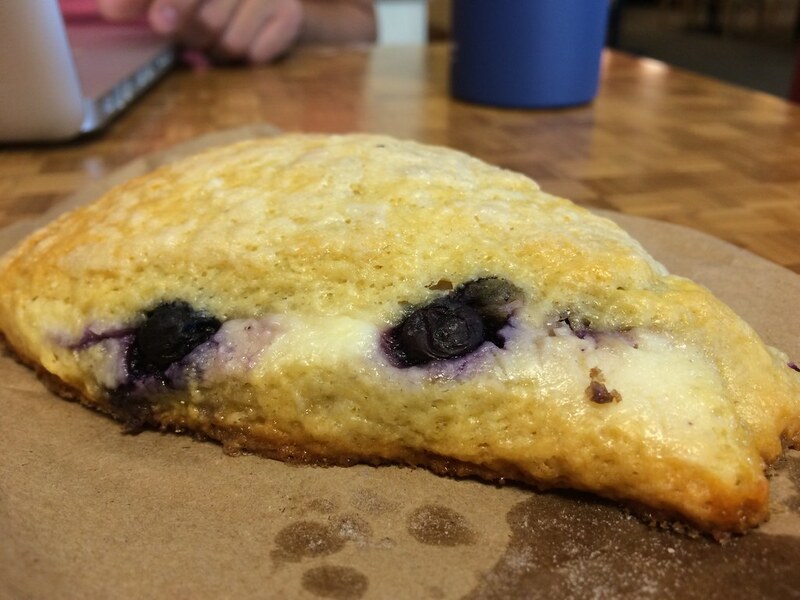 I love a savory scone anyway, and this straddled the line between sweet and savory. Tony got a blueberry cream cheese scone and was so kind to let me have a nibble. And this was soooo good. I'm a little jealous. I love my savory scones, but seriously. This was tasty. I do wish it was a bit firmer. And the bread! I got a loaf of the olive rosemary, and, I kid you not, it was gone within a day. I kept tearing off hunks to just eat on its own. As coworkers would walk by my desk, I would tell them "Hey! New Day is back as Phoenix! Try the bread!" Some came by two or three times for another bite of the delicious bread. 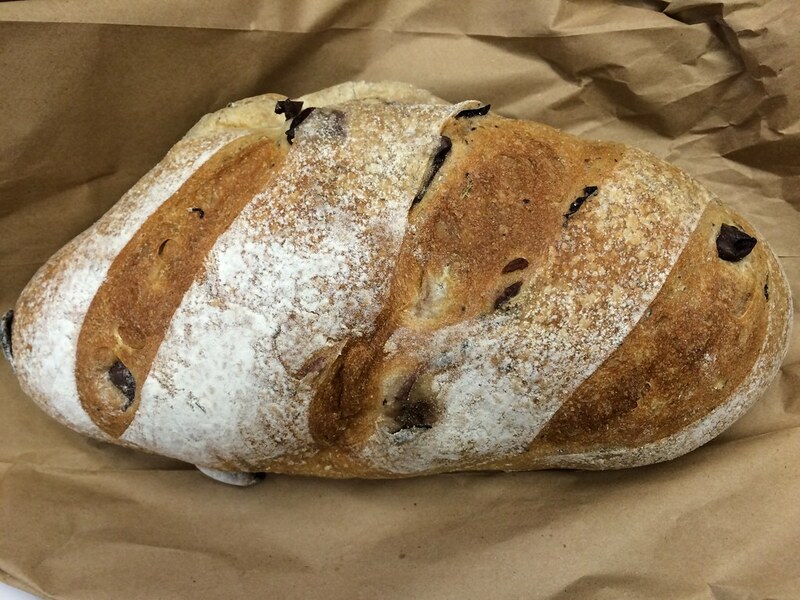 Huge, abundance olives were woven throughout the airy loaf. Just seriously good. OK, and on another day I was back in the evening to get a delicious pizza. They usually have a weekend special, which always sounds delicious. 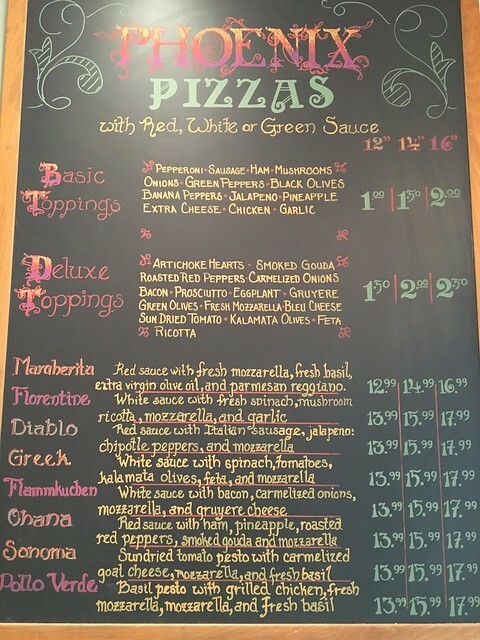 But their standards are good too: Margherita, Florentine, Diablo, Greek, Flammkuchen, Ohana, Sonoma, and Pollo Verde. I've heard the Flammkuchen is quite good, so I went for it: white sauce with bacon, caramelized onions, mozzarella and gruyere cheese. I did, however, add pineapple to give it some light and sweetness. I was worried it might be too heavy on its own. 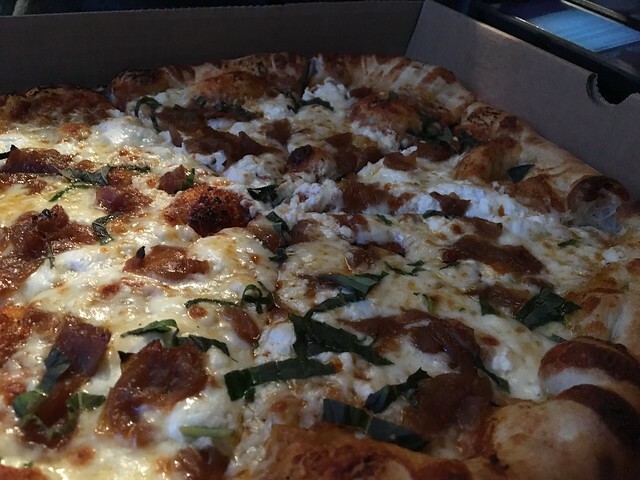 My friend Mariana ordered the Sonoma: sundried tomato pesto with caramelized goat cheese, mozzarella and fresh basil. We sat outside in one of the two tables available. It was chilly, so keep that in mind if you plan to eat here. There is one bench inside to sit while you wait, and then there are two tables outside. And oftentimes, they're taken up. The Flammkuchen was quite tasty! It was super cheesy and had a delicious crust. 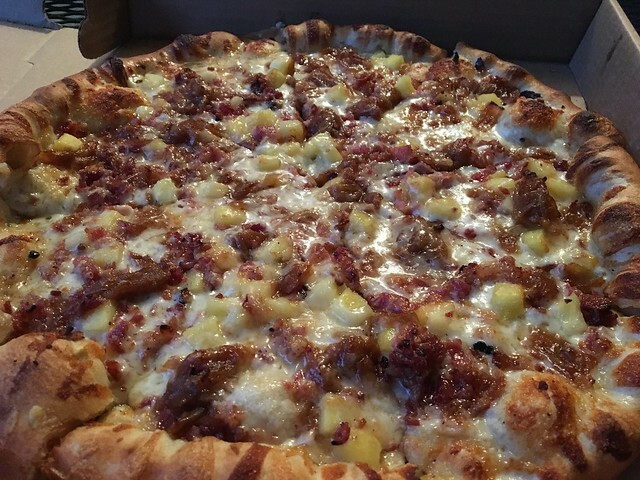 The pineapple was a good call because it gave it some much needed lightness and a texture that had a bit of a bite. The Sonoma was also good - definitely heavier on the goat cheese, so you have to be in the mood for that. Overall, a lovely local place with both delicious baked goods and tasty pizzas. And it still has the heart of the previous bakery.